This collection is near and dear to Christy’s heart and is named after something her father would say throughout her life. Our semi-custom suites are now available. 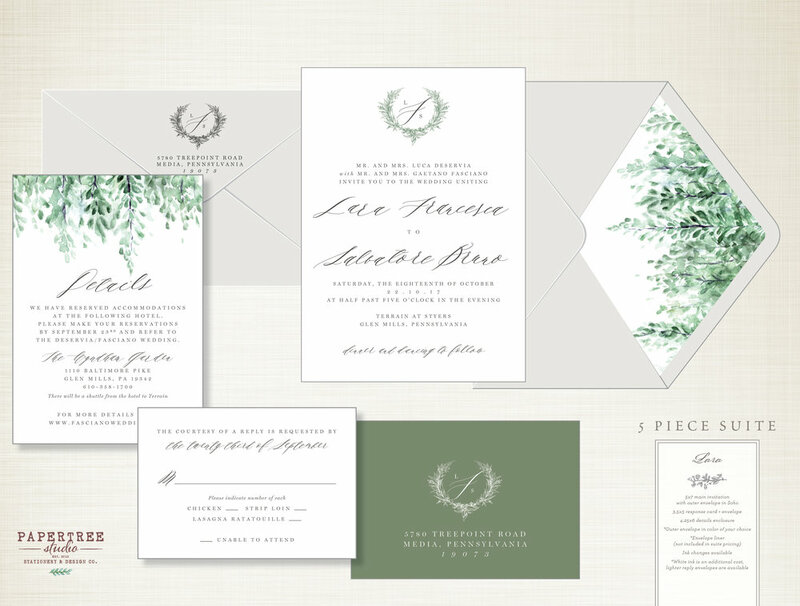 Mix and match colors, envelopes and printing methods to make your invitation suite fit your palette. * If you have any questions, shoot us an email at hello@papertreestudio.net. Choose which suite you prefer and add it to your cart. There are options for a 5-piece suite or 4-piece suite. After you place your order you will get an email from us within 24 hours (note: we are closed on Sunday + Monday). Here you will receive an initial questionnaire to fill out to choose your wording and color options. Once we receive the questionnaire from you we will begin working on your proof. You will receive your proofs via PDF within 5 business days. We include 1 revision in your order so please let us know if you have any changes. This invitation suite is available in all paper options and printing options. Shown here: The invitation, response card with soft grey envelope, details enclosure, beige outer envelope with our green watercolor liner; printed with gold foil on 220lb white cotton paper for the invitation and 110lb white cotton paper for the enclosure cards (mixed media of digital printing and foil). Shown here: The invitation, response card with wine envelope, details enclosure, blush envelope with our floating greenery liner (digital printing on off-white 110lb cotton). Available on any colored paper in all printing methods. Printed on black paper is available in foil and digital. Shown here: The invitation, response card with off-white cotton envelope, details enclosure, dusty rose envelope with our monochrome floral liner; printed with white foil on 220lb black paper for the invitation and 110lb off-white cotton paper for the enclosure cards (mixed media of digital printing and foil). *Also shown here, our noir envelope with digital white ink printing. Shown here: The invitation, response card with beige envelope, details enclosure, forest* envelope with our green watercolor liner; printed digitally on handmade 150gsm black paper for the invitation and 100lb white cotton paper for the enclosure cards. 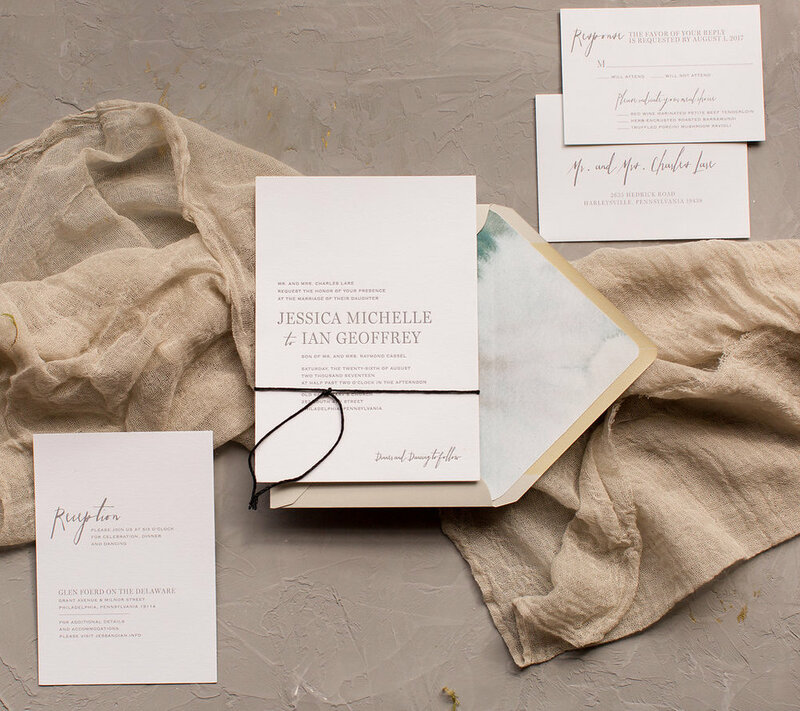 Shown here: The invitation, response card with beige envelope, details enclosure, beige outer envelope with our green watercolor liner; printed digitally on 110lb off-white cotton paper. This invitation suite is available in all paper options and printing options on a white background. For the dusty rose color, it is available in digital and foil. Shown here: The invitation, response card with beige envelope, details enclosure, blush envelope with abstract art liner; printed digitally on 130lb white linen paper for invitation and enclosure cards. 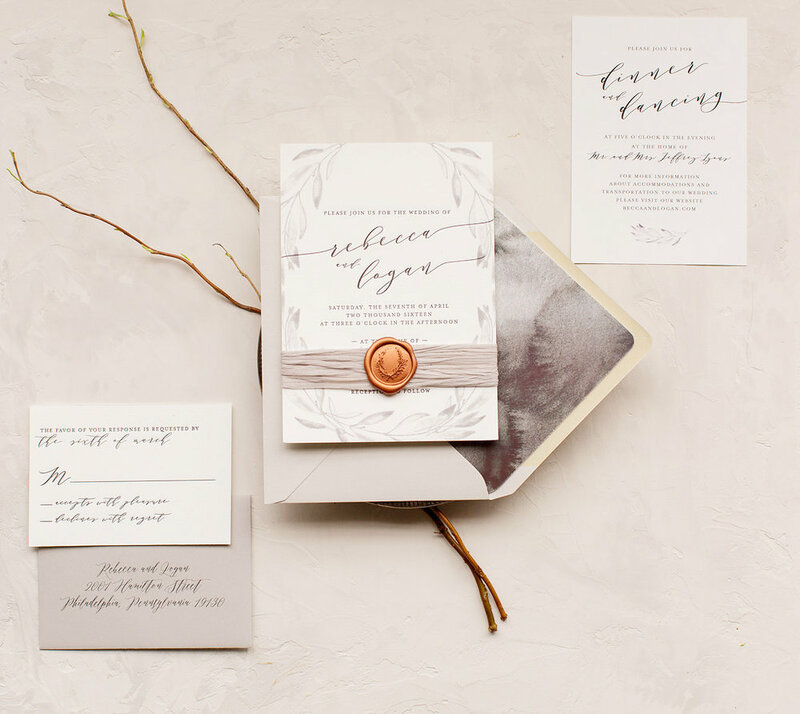 Shown here: The invitation, response card with soft grey envelope, details enclosure, soft grey outer envelope with our green natural leaves liner; printed digitally on 110lb off-white cotton paper. Shown here: The invitation, response card with blush envelope, details enclosure, blush outer envelope with our vintage rosa liner; printed digitally on 110lb off-white cotton paper.